Earlier this week, the request for proposals (RFP) for the audit of the Honolulu Ethics Commission was posted. The RFP outlines several important issues the auditors should cover, but I have a couple of concerns. Two inspectors and prior commissioners who recently left the commission are not listed as interviewees. These people likely have important information that should be considered by the auditor. The other part is just something that I really don’t understand. What the heck is “an internal self-control assessment of improvements needed”? And why is the current executive director supposed to perform this assessment? If anyone has any clues about this, please shed some light by leaving a comment. Requests for bid clarification are due December 2, and deadline to bid is December 30. The RFP is posted on the city’s website. It’s also available here. Update November 28. I found out that the intention of the section on the assessment is to have the executive director perform a “control self-assessment” rather than a “self-control assessment.” Hopefully that clarification will come out with the addenda on December 16. Some people are recommending “no” votes on all 20 Honolulu charter amendments. The questions may seem overwhelming, but a straight “no” without understanding each question is irresponsible in my opinion. unless approved by a majority of the voters voting thereon. Next it’s important to realize and acknowledge that these questions deserve thoughtful consideration. If the majority of votes are “no,” opportunities for improvement in some areas of our city government will be missed. Some people have pointed out that many of the issues behind these questions should not even be in the charter, and that is a valid point. The Honolulu Charter Commission did consider rewriting the entire charter and putting just one massive question on the ballot. I can understand why they didn’t do that, but we should look at simplifying our charter. That would likely cut down on amendments as well as misunderstandings of what each amendment would do. One other thing to consider regarding blank votes is that they do make a statement. If the blanks outnumber the “yes” and “no” votes, perhaps it’s time to rethink the manner in which we make amendments. Please also note that this process is not done after the election. The Honolulu Charter Commission will have at least one more meeting prior to the end of the year. At that time, they will prepare a final report that will be given to the next commission. Testimony will be taken, and I encourage people to submit comments. You can sign up for commission updates by sending an email to cclcharter@honolulu.gov. Correction: this post originally incorrectly stated the second part of the test required for passage of state constitutional amendments. For some people, the election can’t come soon enough. For others, such as voters who are still trying to decipher the 20 charter amendment ballot questions, the question is: Will I have enough time to do research and make an informed decision? For people who are interested in doing their own extended research, the following list may help guide you as you go through the Charter Commission’s website. For each question, I’ve listed the proposal(s) upon which the questions were based and who introduced them. You’ll need these numbers to trace through the minutes and testimonies. If you have questions on any of the proposed amendments, please leave a comment for me. I’d be happy to try and help. Update October 25, 2016, – correction and clarification. It was noted that the description of Question 1 in the pamphlet provided by the Honolulu Charter Commission contains an error. It indicates the chief can “only be removed for continuous maladministration.” The charter actually makes it clear that this should not be construed as the only cause sufficient for removal of the chief. I do not know what the impact of this error will have if this amendment passes, but I still recommend a “yes” vote. Under Question 13 regarding the grants-in-aid process (GIA), certain city grants that currently have a process, e.g., the Clean Water and Natural Lands fund, would continue to go through that process. Others, such as Leeward coast and Office of the Mayor on Economic Development, would be required to go through the GIA process. In 2012 I opposed the resolution that set up the Grants in Aid Fund as a ballot question, and I continue to oppose the fund. It sets aside .5% of general fund revenue annually to be given away to certain nonprofit organizations. This fund has become a political candy pot for the council and was poorly implemented. In addition, we spend about $100 million on social equity programs every year. Mandates like this are simply bad fiscal policy. Discussion on these specific funds expended to include creation of funds in general. Commissioners asked for clarification of the interpretation of wording in the charter before the last change was made in 2012. While fund creation may sound innocuous, we only need to look at the state to see how things can get out of hand. Four proposals related to term limits were discussed. The commission is considering increasing the total number of years for mayor, city councilmembers and prosecuting attorney to a total of 12 years. Neighborhood board members currently have no term limit but would be included in the 12 year limit. The thought behind this is that there’s a steep learning curve, and it’s important to have experienced people and continuity in these positions. One point that was made clear with respect to increasing term limits is that it would not apply to current office holders. Several proposals will be researched further by various commissioners and brought up again, including #69 regarding runoffs for special elections. The commission will meet again Thursday, February 4, and will cover city power, the mayor’s office, city departments under the managing director, planning and two proposals related to the fire department. Here’s an updated list of Meeting topics to be covered at future meetings. The Honolulu Charter Commission met on Friday, and it was nice to see more people testifying than during the last several meetings. The commission’s main topics included ethics, salary commission, fire and police. There are several good ideas contained in the proposals under consideration for ethics reform. One of the best improvements we can make is to have more independence with respect to investigation of waste, abuse and fraud. The main reason I proposed creating an Office of the Inspector General, proposal #107, is because of the conflict between the city administration, the Honolulu City Council and the Ethics Commission. For example, the ethics commission was asked to investigate ORI Anuenue Hale and loans from the city that were forgiven by Honolulu City Council Chair Ernie Martin. The mayor, along with the chair, was investigated by the Ethics Commission, and corporation counsel did its own investigation. They would not share that information with the Ethics Commission, however, and since then have made it difficult for the commission to do its work. An inspector general would be a good complement to our city auditor, prosecutor’s office and the ethics commission. The Charter Commission formed a permitted interaction group consisting of members Broderick, Oshiro and Mulligan to review the proposals related to ethics. It’s not clear, however, how the public can participate in this process, except that emails may be sent to cclcharter@honolulu.gov. Another important topic is the police department and its commission. Civil Beat did a good job of covering that portion of the meeting in their article Police Reform Gaining Steam At Honolulu Charter Commission. The only thing I would add is a reminder that the police chief is suing the ethics commission, which I believe is wrong. As for the salary commission, the Charter Commission voted to support the ideas in 43, which would require that salary commission recommendations go into effect within 60 days if they have a three-fourths majority vote. This proposal was sent to the style committee for further work. Proposal 39, which deals specifically with salaries for Ethics Commission staff, was put under the ethics group’s purview. Proposal 41 was withdrawn by the introducer, member Oshiro. The commission decided to take no action on any fire-related proposals. The next meeting of the charter commission is set for Monday, January 25, and will include the following topics: Legislative branch, elections, terms of office, finance and corporation counsel. Other meetings scheduled are listed here: Meeting topics to be covered. Note the commission will discuss HART and the rail project at its March 4 meeting. City and State Answer Questions about Kalanianaole Hwy. Even before the Kalanianaole Hwy. repaving project started, questions were brought up about crosswalks, streetlights and signal timing. Since most of the job is done, concerns have been brought up about the contra-flow lane and the new yellow striping in the Koko Head bound lanes. Several agencies handle different aspects of the roadway, so it was refreshing to see Ford Fuchigami, Director of the Hawaii Department of Transportation (DOT), Mike Formby, Director of the Honolulu Department of Transportation Services and Ross Sasamura, Director of the Honolulu Department of Facility Maintenance, at the October 1 meeting of the Kuliouou Neighborhood Board. They were prepared to respond to community questions. The city is planning to do three pilot projects using Adaptive Signal Control Technology, and Kalanianaole Hwy. is one of the corridors where this technology will be implemented (after formal approval is received from the DOT). This technology uses real-time traffic information to determine which lights should be green. This sounds like a great idea, but it’ll be important for us to monitor once it’s installed. The city is also looking at its crosswalk policy, especially in light of the number of pedestrians who have been killed while in mid-block crosswalks. Guidelines are regularly updated, but old crosswalks are grandfathered in and rarely removed. Kalanianaole Hwy. in east Honolulu has several mid-block crosswalks, but only one that has a separate signal. Some mid-block crosswalks may be eliminated in the future. There were a couple of incidents of motorists driving the wrong way in the Koko Head-bound lanes, because the contra-flow lane hadn’t been set up. To provide motorists with advance notice of the status of the lane, a new sign with a beacon will be installed, most likely at the intersection of East Halemaumau. In addition, the regular sign posts in the lane itself are being used again. During road repaving, the metal sleeves that allowed signs to be put up were removed, and cones were used all the way down the contra-flow lane. One of the tradeoffs of roadwork is that it does take a while to reinstall things like the sleeves, sensor loops and pavement markings. And those yellow lines? They’ll likely remain, as they are now part of federal guidelines. Ford Fuchigami announced that the state is going to be replacing its streetlights with LEDs. Some members of the board expressed concerns about the potential brightness of the lights. Ford reassured the board that the state is following Dark Sky guidelines. The planned lights will be 4,000 Kelvin, which is the same as the city, but the state is also including smart controls, which would allow the lights to be dimmed. (This is something the city’s plan does not include.). I have asked for a copy of the state’s plan. Did you ever wonder why we don’t use recycled glass in our asphalt? I have, and now I know why it’s not used more often. According to Ross Sasamura, the city used recycled glass on a driveway for the Waipio Soccer Park. It’s reflective and could cause confusion with road markings. When roads are reconstructed, two layers of asphalt are used. I would think that recycled glass could be used for the bottom layer, without any negative impact. I’m following up with the city on this. In the meantime, tumbled glass can be used in some landscaping settings and looks quite nice. One thing that was not brought up at the meeting but I wanted to share anyway is the right-turn-only-lane in front of Roy’s Restaurant at Keahole Street. There is currently a solid white line separating the lane from the regular town-bound lane. Motorists are only supposed to cross solid white lines in emergency or unusual situations, so technically people shouldn’t be turning right there. The state has been notified of the error and will correct it. I wonder, however, how such a mistake was allowed to apparently pass through planning reviews and then actual installation on the roadway. Didn’t anyone think to ask why it was solid the entire length? Even though Hawaii is in the middle of the ocean, we’re not off the hook. People who live in the urban areas of Oahu already cannot see stars at night, and teachers of astronomy recommend that their students go to the North Shore for best viewing of the night sky. Light pollution on Oahu. 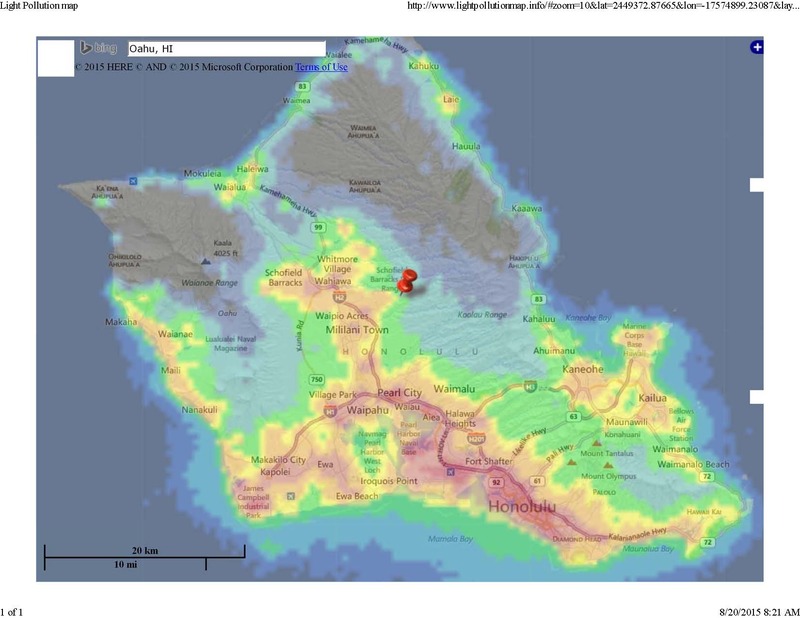 Additional maps available at Light pollution maps. Stars are “disappearing” because of light pollution. It comes from various sources — our own homes, decorative yard lights, security lights, park lights, street lights, etc. The good news is that we can reclaim the stars. We can start with our own homes by using low glare fixtures and motion detectors and turning off lights when they’re not in use. In addition, we can make sure our political representatives know how important the night sky is to us. Mayor Caldwell and his administration plan on replacing all of the city’s street lights with LEDs over the next few years. It’s good that he recognizes the need to reduce our energy consumption, but you can read about some concerns related to this project in City’s LED Project Needs Revisions. My son, Orion, was named after a constellation, and it makes me sad to think that his children will probably not be able to see his namesake. What about you? Please post your thoughts. For more information, see: Darksky.org; Flagstaffdarkskies.org.